Dr. Emerson is an associate professor of pathology at the University of Utah School of Medicine. She received her MD from the University of Texas Health Sciences Center at Houston and served a residency in pathology at the University of New Mexico Health Sciences Center and the University of Texas Health Sciences Center. Dr. Emerson completed her fellowship in general surgical pathology at the University of Utah Hospitals and Clinics and is certified by the American Board of Pathology in anatomic pathology. 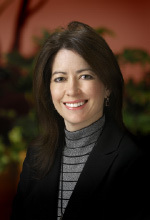 She is a member of the United States and Canadian Academy of Pathology, American Society for Clinical Pathology (fellow), and the Huntsman-Intermountain Cancer Care Program. Dr. Emerson's current research interests include molecular characterization of the initiating mutations in lung cancer.